John Adams Dix was born in Boscawen, New Hampshire, on 24th July, 1798. At fourteen he joined the Royal Artillery as a military cadet. After the death of his father, a major in the army, Dix helped to support his mother and his younger brothers and sisters. He served on the Canadian frontier and reached the rank of captain. Dix became a close friend of John C. Calhoun, the vice-president of the United States, and with his encouragement, in 1828 he left the army and studied law. He worked as a lawyer in Cooperstown before being appointed adjutant governor of New York. Dix joined the Democratic Party and in 1845 was elected to the Senate. After serving as postmaster of New York City he was appointed Secretary of the Treasury by President James Buchanan in 1861. 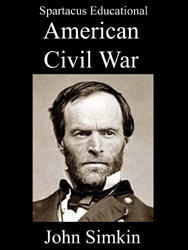 On the outbreak of the American Civil War he joined the Union Army. Appointed as a major general in May, 1861, he was placed in command of the Department of Pennsylvania. 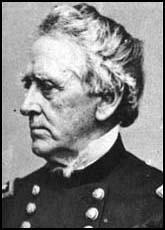 In July, 1862, Dix was given the task of negotiating the exchange of prisoners with General Daniel H. Hill of the Confederate Army. They decided that the rate of exchange was one general for every 60 enlisted men, a colonel for 15, a lieutenant for 4 and a sergeant for 2. In 1863 General Henry Halleck replaced Dix in these negotiations. 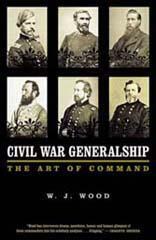 Dix was commanded the Department of Virginia (June, 1862 to July, 1863) and the Department of the East (July, 1863 to April, 1865). After the war Dix was Minister of France (1866-69) and governor of New York (1872-74). John Adams Dix died in New York City on 21st April, 1879. The advent of Hitler to power in 1933 had coincided with a high tide of wholly irrational pacifist sentiment in Britain, which caused profound damage both at home and abroad. At home it immensely aggravated the difficulty, great in any case as it was bound to be, of bringing the British people to appreciate and face up to the new situation which Hitler was creating; abroad it doubtless served to tempt him and others to suppose that in shaping their policies this country need not be too seriously regarded.